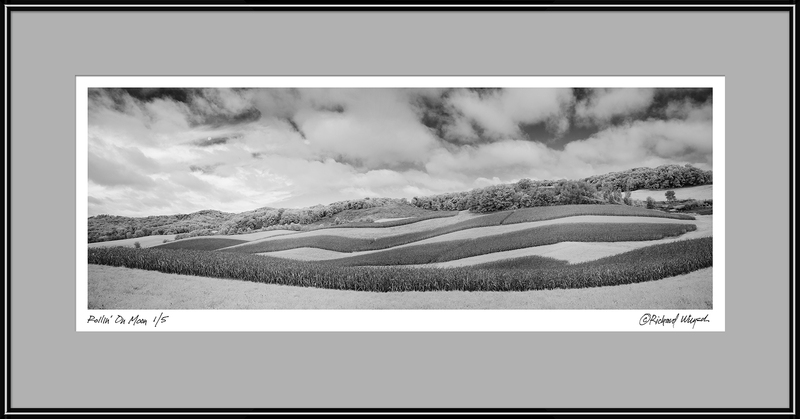 My photographs are included in a juried exhibition of new works organized by the NE Chapter of Wisconsin Visual Artists. All exhibition artworks were created during the last six months. The exhibition is on view April 27 through May 17 at the artlessBastard gallery, 353 Main Avenue, DePere, Wisconsin. The time frame for eligible work presented some challenges for me. 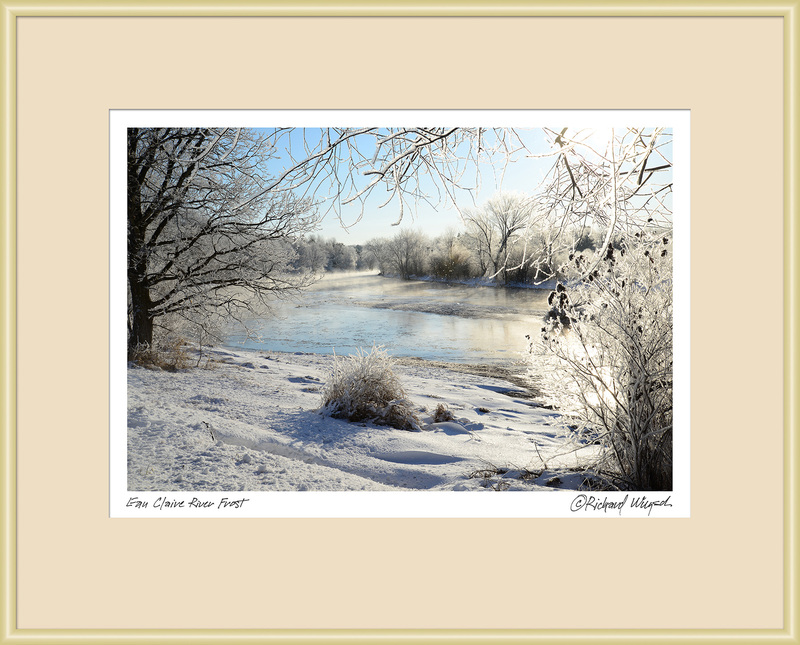 Through the first half of January, there was no measurable snow that stayed long enough to allow me to capture good winter images. 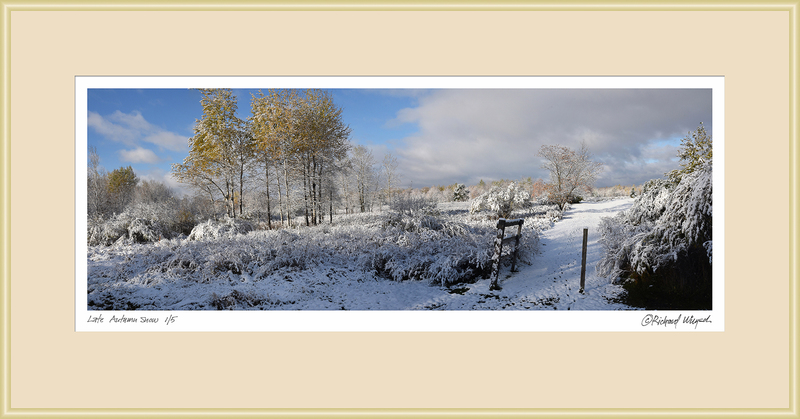 However, on the morning of October 15, I managed to get a few shots during a short-lived snowfall.Late Autumn Snow was captured early in the morning east of Wausau, before the snow melted away. In late September, I attended the opening reception for the inaugural Confluence of Art annual exhibition at the new Pablo Center in Eau Claire. 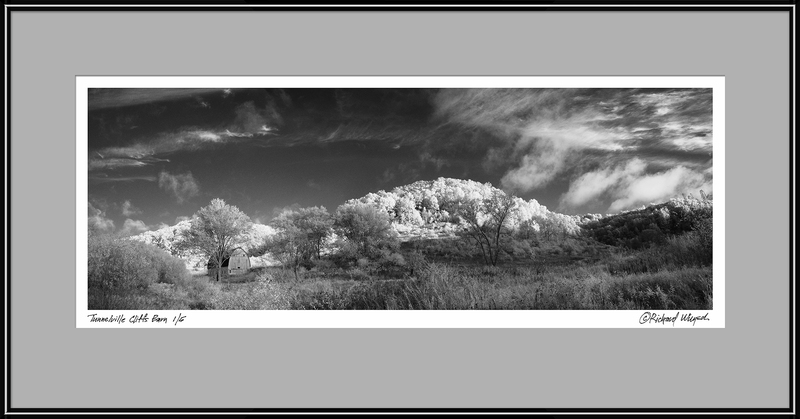 The next morning, although it was cloudy in Eau Claire, I decided to head south and meander back roads, hoping to capture a photograph or two. Just north of Mondovi, the clouds parted briefly over a field of rolling, sculpted corn rows. While editing these photographs, one image revealed an almost-full moon peeking through the clouds. Rollin' On, Moon is the result. Dock on the Farm Pond is included in the Neville Public Museum's 74th annual juried exhibition. An area west of Black River Falls in the northern Driftless Region is the setting for Dock on the Farm Pond. 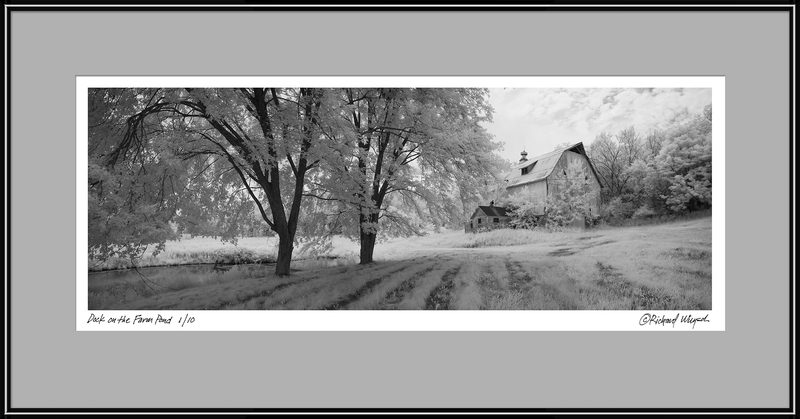 I used black-and-white infrared photography to suggest a bygone era of Wisconsin farming. Lena Vigna, curator of exhibitions at the Racine Art Museum, served as juror for the Neville Art Annual. She wrote: "Bold color, imaginative narratives, and inventive processes and approaches to materials were the name of the day. Kudos to all the entrants for offering up their creative output." The Art Annual is on view May 11 through June 9, at the Neville Public Museum, 210 Museum Place, Green Bay, Wisconsin. For more information Neville Public Museum. After the Stormand Eau Claire River Frostare featured in the 24th annual juried exhibition "Water Works," at Gallery 110 North. Located in the Plymouth Arts Center, 520 E. Mill Street, Plymouth, the exhibition is on view from May 10 through August 2. On the a late June evening, a series of passing storms created ideal conditions for a rainbow. I grabbed my camera and set out for my favorite post-storm spots. Driving east of Wausau on Townline Road, a rainbow appeared, but quickly disappeared. As I reached "the" spot, the sun was setting in the western sky and there was a break in the clouds at the horizon. I waited and watched. About twenty minutes later, the sun broke through and a small rainbow appeared at the southeast horizon; I took a couple shots. As the rainbow was fading, the real drama started. After the Storm is the result. For more information Plymouth Arts Center. 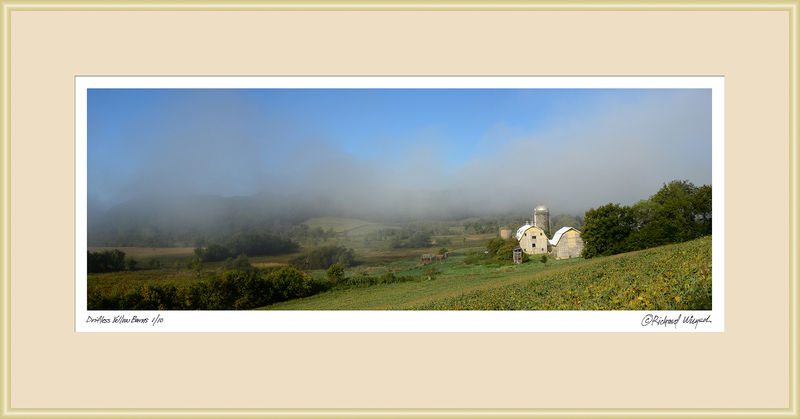 Driftless Yellow Barnsand Tunnelville Cliffs Barn will be featured in the 2019 "Culture & Agriculture." This New Visions Gallery juried exhibition, now in its 33rd year, is one of the most popular and well-attended. "Culture & Agriculture" celebrates art that has in some way drawn inspiration from agriculture -- modern or historical. The exhibition opens dialogues about agriculture, how it has impacted our society, and how it will continue to shape us in the future. 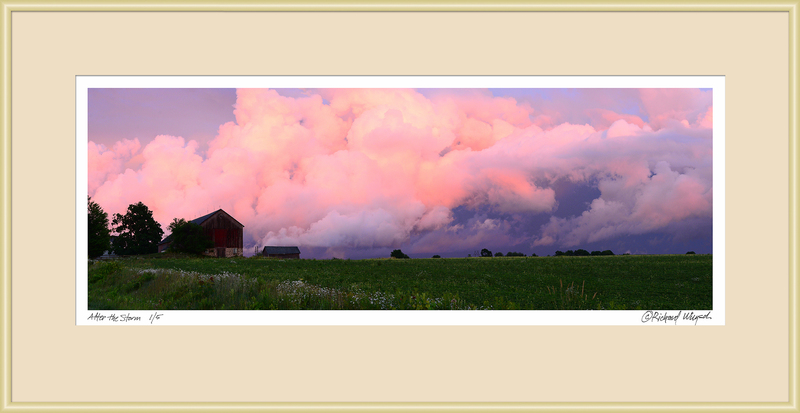 Driftless Yellow Barns -- a classic scene -- was photographed after many trips to this location. Patiently waiting for fog to clear near Richland Center paid off. Tunnelville Cliffs Barn was captured near the Tunnelville Cliffs State Natural Area, west of La Farge, in Wisconsin's Driftless Region. New Visions Gallery is located at 1000 North Oak Avenue, Marshfield; "Culture & Agriculture" is on view from May 20 through July 26. For more information New Visions Gallery.